Find the freebies and avoid the caveats with these tips. 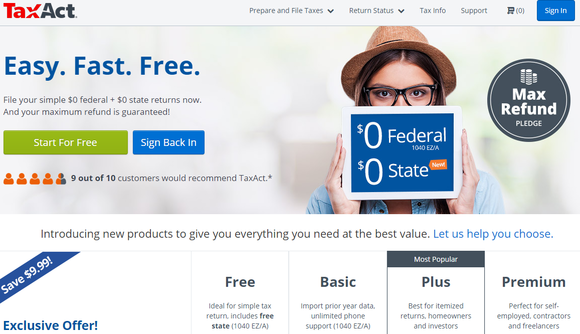 By now, you’ve probably seen the TV ads trumpeting free online tax prep. It’s natural you’d be intrigued. After all, we fork over enough of our hard-earned income in this yearly ritual, it would be nice to save some shekels on e-filing. While there are a number of legitimate offers for free online tax prep and filing, you want to be aware of all the fine print that might turn a freebie into a paid service. Read on for tips on where to find the bargains—and how to avoid the caveats. Your first stop should be the IRS FreeFile site—the government’s program to encourage electronic filing. Use the link above, because if you do a Google search for FreeFile you could stumble into an ad for a commercial site that might have a free option but doesn’t display the full range of free services available. On the IRS site, you’ll find a wizard to guide those with an adjusted gross income of $62,000 or less to commercial services whose profile they fit. For example, some services offer free software to military personnel, while others filter applicants by age. Only a few services offer free tax-prep software and e-filing for state as well as federal returns. Note that to avail yourself of these offerings, you must get to the tax-prep service from links on the FreeFile site. Going directly to the commercial provider will get you to different service packages. The IRS’s FreeFile site lists options for free e-filing that you won’t find if you go to the individual tax-prep sites directly. The IRS site also offers free electronic tax forms and e-filing for people whose AGI exceeds this year’s $62,000 income limit for using FreeFile services. This is a useful option for people who don’t need tax advice (beyond the information in the IRS forms themselves) and just want help doing the math (the forms do the calculations). But you’re on your own for state returns. 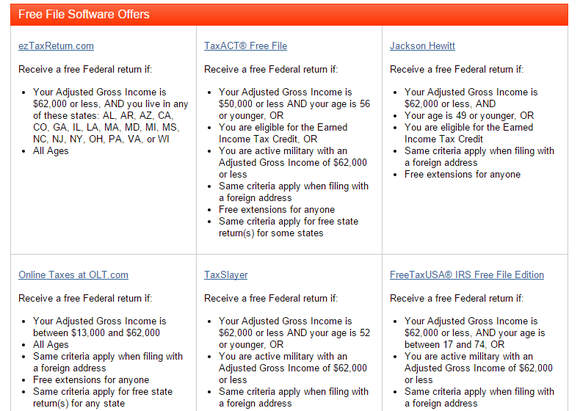 If you don’t meet the criteria for free tax-prep software through the IRS FreeFile site, try visiting a few commercial sites. As previously stated, going to a commercial site directly (as opposed to using a link on the IRS’s site) gets you to a different landing page, but for some filers this might not be a bad thing. On TurboTax’s Absolute Zero site, for example, you can get free federal and state software and e-filing—as long as you can file using a 1040EZ or 1040A form. 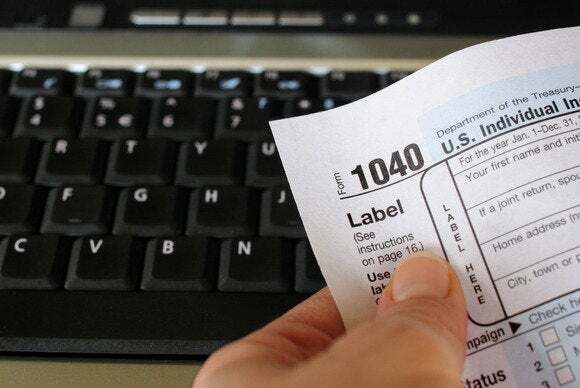 In other words, your tax situation must be relatively simple: Your adjusted gross income cannot exceed $100,000; you can’t itemize deductions (including mortgage interest); and you cannot receive income from most sources other than salaries, simple interest and/or dividends, unemployment insurance, pensions, and Social Security. If you run your own business, you're out of luck on any of these options. You must file a Schedule C for sole proprietorships, which is only available in a regular 1040. TurboTax’s Absolute Zero service offers an easy-to-use interface, not unlike its popular paid service. TaxAct has free e-filing options for both state and federal returns, whereas many commercial services only offer the latter. Now that you know your free options, check these exceptions to avoid any unpleasant surprises. Some freebies have deadlines: Tax season has just begun, since employers and institutions had until the end of January to provide us with the forms they share with the government (e.g. W-2s, 1099s). But some freebies are unlikely to last through the filing deadline (April 18 this year, due to Washington D.C.’s observance of Emancipation Day on April 15). Intuit says its promotional deals will likely expire in mid-March. So try to file early if you want to take full advantage of the program. Know what you're not getting: Free tax-prep software generally has limitations beyond the income and tax situation requirements of a 1040A or 1040EZ return. For example, one nice benefit of using Web-based software is that the service usually keeps your previous information on file, which can be useful if your return requires such info (for example, if you’re depreciating business assets over time). The ability to import electronic W-2 and 1099 info (if available from your employer or financial institutions) is a time-saver that typically requires using a paid service. This year, however, even people using TurboTax’s Absolute Zero service can use a smartphone to capture and input info from a printed W-2. In examining offers, understand that electronic tax prep and e-filing are not synonymous. You may run into sites that charge you separately for e-filing. Want mobile? The latest trend in online tax prep is the ability to prepare your return on a smartphone or tablet or a Web browser. 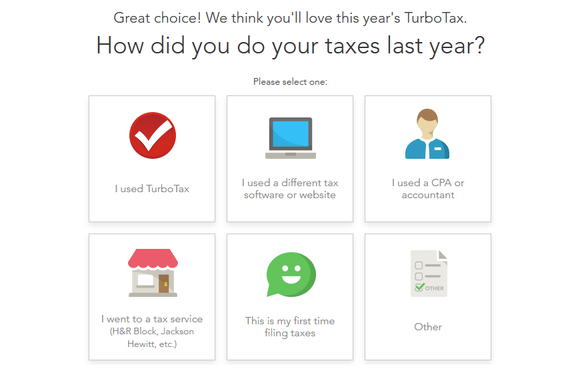 This is something you should check on when choosing a tax-prep service: The best ones, including TurboTax, will let you work on your return on any device you happen to have at hand. To see how flexible a tax-prep service is, try creating an account on one device and then accessing it from the other devices you intend to use. See if a dedicated app is required.